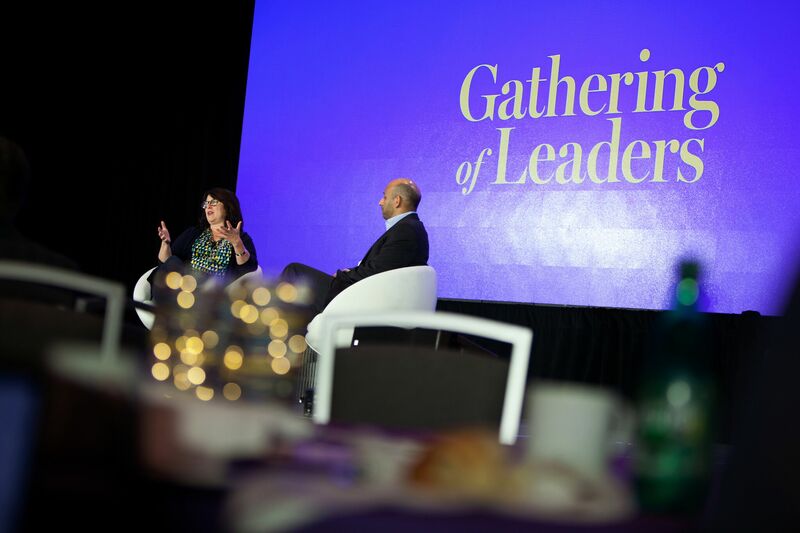 The 2018 Gathering of Leaders is over and we are filled with profound and immense gratitude for the insight, inspiration, and urgency that our community of social entrepreneurs, philanthropists, young leaders, and other changemakers brought to Boston last week. Being surrounded by futurists and the breakthrough generation that is carrying the social impact sector forward was the best possible way to celebrate New Profit’s 20th anniversary. Thanks to everyone who attended! 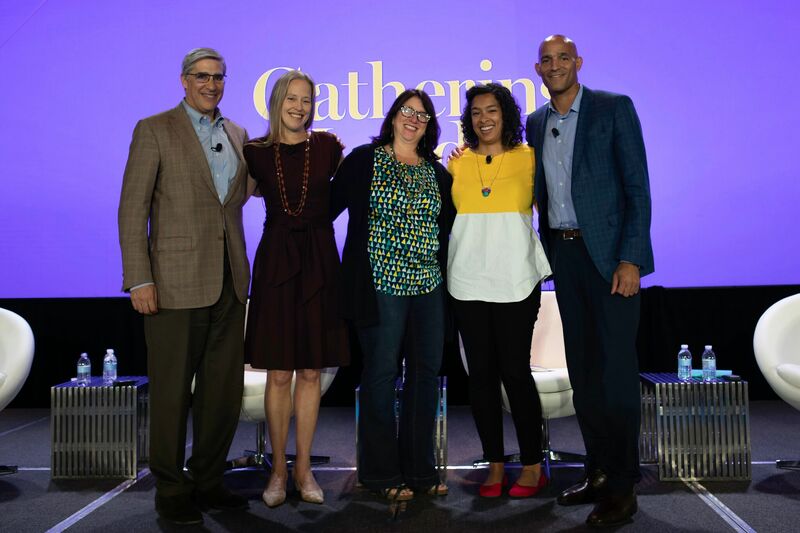 Below is our recap of the Future and Our Work conversation that happened on Day 2 of the Gathering; you can read our recap of Day 1 here. 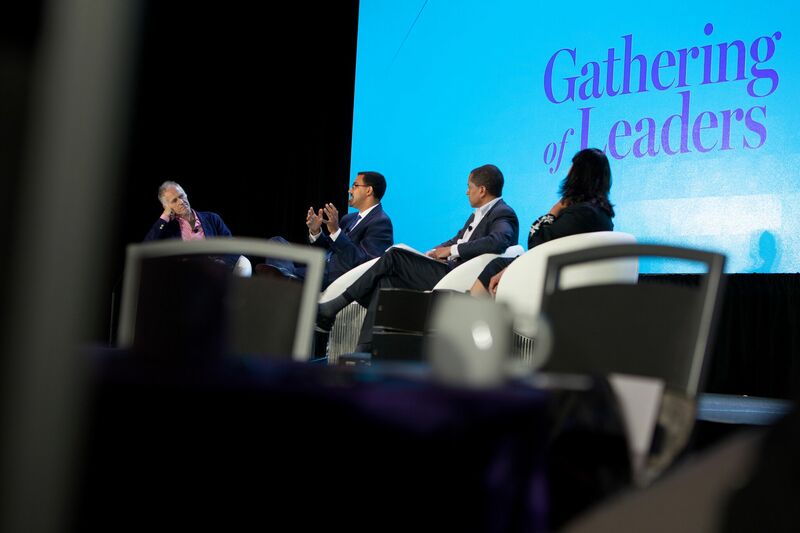 Deloitte Consulting LLP, a presenting sponsor of the Gathering and longtime collaborator with New Profit, helped the day and the dialogue truly lift off in two ways. Sam Silvers, Deloitte’s social impact chief who oversees the purpose work of tens of thousands of employees in America, took the stage to make the surprise announcement that the company will renew its pro bono commitment to our network of social entrepreneurs for the next *THREE YEARS*! The commitment means that the new generation of leaders in our network will benefit from the same transformative, Fortune 500-caliber strategic support that earlier grantee-partners have benefited from. Deloitte Principal and Global Future of Work Market Leader, Steve Hatfield, also gave an electrifying presentation on the powerful, intersecting forces that are changing the way we live and work. He then moderated a panel with three leaders who are at the forefront of efforts to transform education and the labor market: John B. King Jr., President and CEO of The Education Trust and former Secretary of Education; Palak Shah, Director of Social Innovations at the National Domestic Workers Alliance; and Byron Auguste, CEO and Co-Founder of Opportunity@Work. Future and Our Work "Mini Learning Labs"
Participants broke out into series of roundtables about new ideas, models, tools, and approaches that have potential to accelerate social impact, including: building equitable entrepreneurial ecosystems with Forward Cities’ Chris Gergen and Ewing Marion Kauffman Foundation’s Larry Jacob; artificial intelligence, equity, and social impact by FountainHead Ventures' Venkat Srinivasan, AI Now Institute’s Meredith Whittaker, Mission: Launch’s Teresa Hodge, and Think of Us' Sixto Cancel; rural innovation in philanthropy from Foundation for Appalachian Kentucky’s Gerry Roll, Cassiopeia Foundation’s Stephanie Randolph, and Farm Commons’ Rachel Armstrong; transforming the labor market with technology and data by LaborX’s Yscaira Jimenez and Opportunity@Work’s Byron Auguste; data innovation featuring Project Evident’s Kelly Fitzsimmons, FII’s Jesús Gerena, PowerMyLearning’s Elisabeth Stock, Third Sector Capital Partners’ George Overholser, and Conservation Law Foundation’s Vedette Gavin; personalized learning with ImBlaze’s Andrew Frishman and LEAP Innovations’ Phyllis Lockett; democratizing fundraising with Causemo’s Jeff Habib and Ryan Carpenter; and blockchain’s potential to change social impact work with Voatz’s Nimit Sawhney. America Forward, New Profit’s nonpartisan policy arm, led a working session on navigating the policy landscape and advancing social innovation at this challenging moment in America. The packed session looked into areas of opportunity to build on the policy advocacy work 70+ organizations in the America Forward coalition have done in recent years to mobilize $1.7 billion for social innovation. 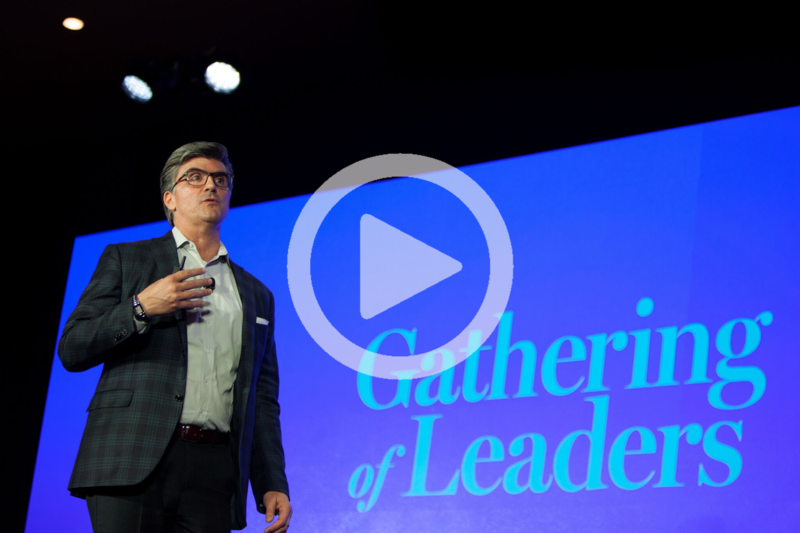 A series of “flash talks” were delivered about pathways to systemic change in learning, career credentialing, and higher education by Ulrik Christensen, Executive Chairman of Area9; Sherman Whites, Director in Education at the Ewing Marion Kauffman Foundation (a 2018 Gathering of Leaders presenting sponsor); and Carla Brodley, Dean of the College of Computer and Information Science at Northeastern University, respectively. "Some of us working to design the 'future of learning' are wrestling with a cognitive dissonance with regards to college. On one hand, the narrative we are increasingly promoting is college is becoming less relevant, that we can equip students with apprenticeships and industry badges and credentials so that, immediately upon graduating high school a young adult can go out and get a living wage job and make a good life for herself. But many of us are still preparing our kids for four-year university, and encouraging them to forgo the very opportunities we are designing for others." In one of the most highly anticipated and exciting moments of the Gathering, former and current New Profit grantee-partners Wendy Kopp of Teach For All, Laura Weidman Powers of Code2040, John Rice of Management Leadership for Tomorrow, and Gerald Chertavian of Year Up discussed the entirely new mindsets, methods, partnerships, and bold actions that are going to be needed from leaders if social impact is going to be accelerated in the imminent future of work landscape. The group was introduced by New Profit Managing Partner J.B. Schramm, who led PeerForward (formerly College Summit) before joining us to launch the workforce development-focused Learn to Earn Fund. Said Kopp, “We are fighting the forces of gravity, because the same patterns exist everywhere around the world. But there’s a silver lining, which is that the solutions are out there and they are much more shareable than we realized." Following the closing call to action, New Profit’s Delanoe Johnson and Berklee College of Music’s Dom Jones performed a spoken word piece on equity called “911 - What’s Your Emergency?” The piece centered on the notion that in order for us to move into the future world that we want to see, we must address the underlying issues that stand in the way of our vision and use our voices to promote change. 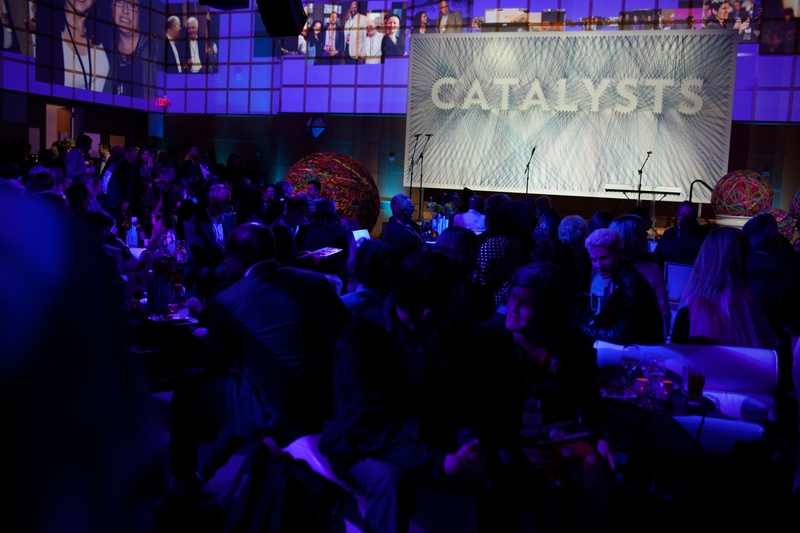 In addition to the two days of deep dialogue on lessons learned from the past and bold action needed in the future, New Profit held a 20th anniversary celebration called Catalyst at the John F. Kennedy Presidential Library & Museum and the Edward M. Kennedy Institute for the U.S. Senate. The event brought together the largest group of New Profit social entrepreneurs, donors, former and current staff, former and current board members, friends, and other partners that we have ever assembled. We’ll have much more to share about the Gathering, including full video of the plenary sessions and other material, soon. Thank you to our 2018 Gathering of Leaders Sponsors! 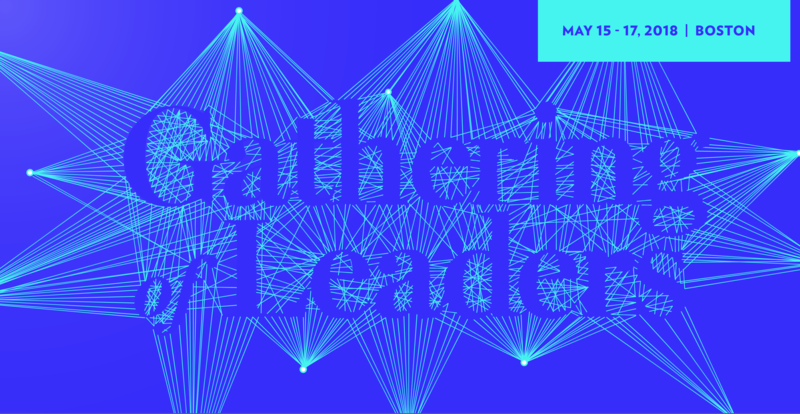 A sincere thanks to our 2018 Gathering of Leaders production partners: Alphagraphics, the Berklee College of Music, the Boston Renaissance Waterfront Hotel, Corinthian Events, the Edward M. Kennedy Institute for the U.S. Senate, Hiker, the John F. Kennedy Presidential Library & Museum, Rafanelli Events, Varvid, and photographers Lexie Moreland and Jenna Greene.